Who is most likely to be killed by lightning? From 2006 through 2012, 238 people were struck and killed by lightning in the U.S. Were most of these deaths during leisure or work activities? Were more deaths while people were playing golf or soccer? The National Weather Service (NWS) has tallied statistics and has some advice, too. Daily routine includes walking to or from a vehicle, waiting outdoors for transportation, walking to or from home, and yard work. Included in the other category were deaths related to loading trucks, surveying, door-to-door sales, logging, mail delivery, utility repair and work at an amusement park. Fatalities that occurred when traveling to or from work were categorized as daily routine. Is golf a big factor? The common belief that golfers are responsible for the greatest number of lightning deaths was shown to be a myth. Why is that the case? In other words: Safety training and education work. Stay off and away from anything tall or high, including roofs, scaffolding, utility polls and ladders. Stay off and away from large equipment such as bulldozers, cranes, backhoes, track loaders and tractors. Don’t touch materials or surfaces that can conduct electricity, including metal scaffolding, metal equipment, utility lines, water, water pipes and plumbing. Leave areas with explosives or munitions. 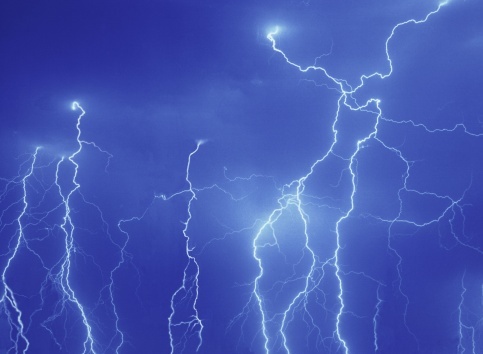 If workers hear thunder, they should get to a building or enclosed vehicle. Advice if someone is struck: Lightning victims don’t carry an electrical charge, are safe to touch and need urgent medical attention. Cardiac arrest is the immediate cause of death. Some deaths can be prevented if the victim receives the proper first aid immediately. Call 9-1-1 and perform CPR if the person isn’t responsive. Use an automated external defibrillator if available.